Wesham had a great day at the races on Sunday at the Northern Athletics Women’s 6-Stage and Men’s 12-Stage Road Relays, held for the first time in Birkenhead Park, the first publicly funded town park, developed to improve poor health conditions brought on by the industrial revolution and provided the inspiration for New York’s famous Central Park. Wesham had two teams in the Women’s 6-Stage, with 12 ladies tackling a course of 2 long laps of 8.4km and 4 of 4.3km. In the “A” team, Tanya Barlow and Kay Twist ran the long stages and clocked 38:56 and 40:07 to finish 47th and 49th respectively. Louisa Denye (20:22); Julie Rooney (22:09); Sharlan Butcher (23:35) and Sue Rigby (21:29) ran the shorter stages. In the “B” team Maureen Danson (39:26) and Pauline Eccleston (40:14) ran the two long legs while Sue Coulthurst (16:38); Julie Topping (25:25); Anne Berry (20:52) and J Sanderson Woodman (24:08). The two teams were very closely matched, with the two Julies finishing together at the end of Stage 3, and the final cumulative times being 2:46:38 and 2:46:43 for 46th and 47th positions. 55 teams had started the relay on Stage 1. The Coniston 14 took place on Saturday in good conditions on the challenging circuit around Coniston Water. There were just three Wesham runners in this event that the club used to dominate. Helen Lawrenson finished 21st woman and 6th W45 in 1:48:22 to come in 218th overall. Stephen Browne was 341st and 48th M50 in 1:55:26. Paul Carter finished 683rd in 2:12:44. 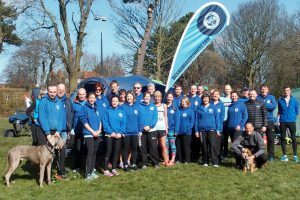 The Wesham Trail Running club championship continued on Saturday at the Warrington 5-Mile Spring Trail Race. David Taylor really pulled out the stops and he finished 2nd in 31:18 over a very undulating course with some sharp steep ascents. Paul Gregory tried to hang on to him but he came in 8th in 34:19, a repeat of last week at Roddlesworth. Steven Gore kept in contact placing 11th with 34:58. Gemma Owen ran well to finish 5th woman, 4th W35 and 32nd overall in 38:26. Kerry Eccles finished 25th woman and 18th Over-35 in 45:28, 84th overall. Vicky Gore was 27th woman and 87th in 45:46 20th Over-35. Anne Berry was 125th and 31st in 49:08. The Garstang Gallop 7-mile road race saw two Wesham members running. Paul Hetherington had a great run to finish 1st M40 and 11th overall in 43:53. Mark Dobson was 96th in 60:55 and 12th M50. There were just three Wesham runners in the Lytham Hall parkrun on Saturday morning. Alex Rowe ran 20:11 for an M60 age graded performance of 79.44%. Graham Cunliffe ran 26:15 for M60 61.65%. Debbie Bell clocked 29:34 for W40 53.21%. In the Preston parkrun Nigel Shepherd ran 22:44 for M55 69.94% and Robert Brown had 26:07 and an M60 performance of 61.39%. Chris Pike clocked 25:44 for M40 54.27% an improvement on last week and Martin Bates was in Keswick to run 23:38 in his debut there with an M60 grade of 68.48%. Also on parkrun tourism Finlay McCalman ran in the Fell Foot parkrun at the southern end of Windermere to run 29:38 for M50 51.41%. James Mulvany ran the second fasted time at the Blackpool parkrun with a swift 17:43 for M40 77.05%. Dave Marsland had M60 72.63% performance with a time of 22:28. Sean Murray ran 22:33 for M35 58.46% and Rob Wallace 22:44 for 56.74%. Sara Ward clocked 24:26 with W50 70.33%, and Dave Young 25:58 for M70 grade of 67.91%. Andrew Moore ran 26:46 and M55 57.91%.